Visitors to Red Cloud are invited to book a stay with the Willa Cather Foundation at the Cather Second Home. 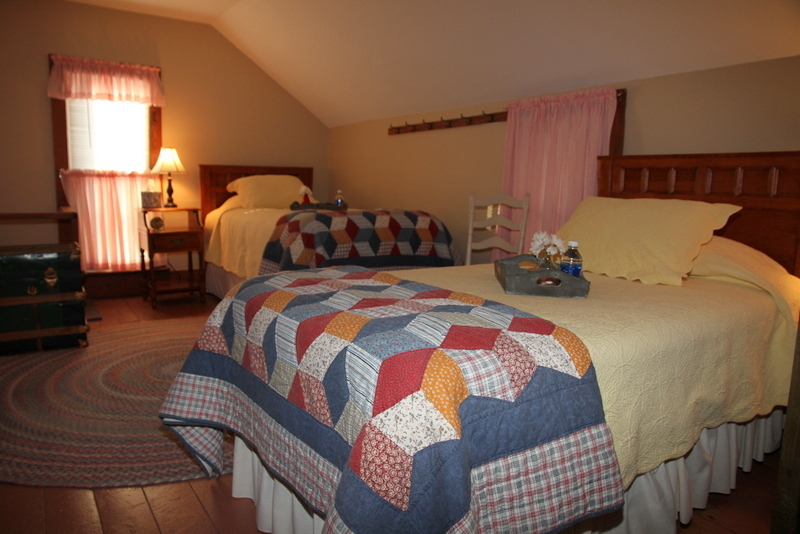 Guests may rent the room that was Cather's, or the rooms of her parents and siblings. The entire home may also be rented for family retreats, meetings, and special occasions. The Cather Second Home once provided Cather with a nurturing and encouraging atmosphere in which to work, while Red Cloud and its residents gave her inspiration and insights. The house—now owned and operated by the Willa Cather Foundation—is a retreat for guests as it was for Willa Cather. 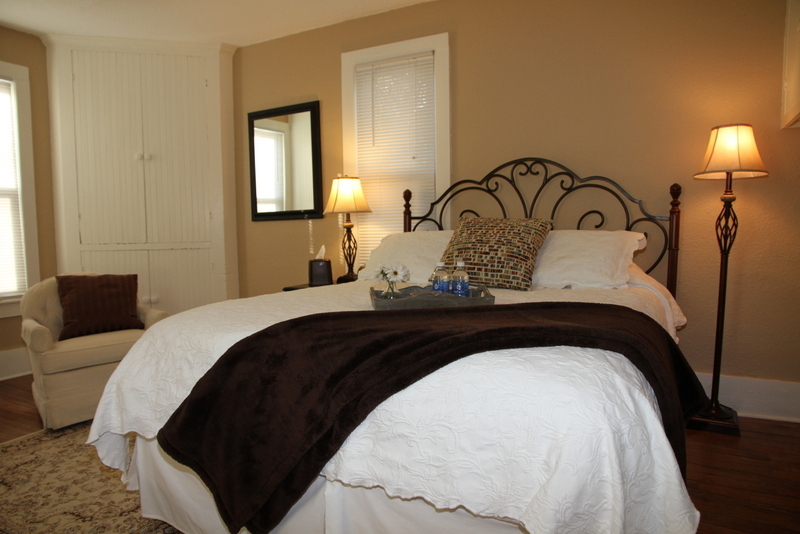 There are 6 cozy guest rooms and 2.5 baths. The Cather Second Home is located at 541 N Seward St.
Additional lodging options in and around Red Cloud can be located here and at www.visitredcloud.com. The Cather Second Home is a host-free guest house located within walking distance of the Willa Cather Foundation’s headquarters at the Red Cloud Opera House, as well as downtown restaurants and shops, a grocery store, and the Auld Public Library. Each guest bedroom has a comfortable chair for reading and relaxing, throw pillows, armoires or chests, and personal robes. A main level shared bathroom contains a pedestal sink and walk-in shower. An upper level shared bathroom is quite spacious and features a claw-foot tub with shower extension and a large vanity. An additional shared half-bath on the second floor is situated at the top of the stairs. Guests are free to use our fully furnished kitchen, including dishes, flatware and cooking utensils. The kitchen is stocked with coffee, teas, and condiments. A self-serve continental breakfast is provided. Guests may also prepare their own meals and are encouraged to enjoy dining at the large quartersawn oak table, which seats 6-10 guests. The front parlor offers a relaxing and comfortable setting for family gatherings, book clubs, quilt groups, and other guests. The back parlor features beautiful antique furnishings and a library of books and games. An intimate sun porch provides a private space for reading or quiet reflection. The home has a secluded brick patio in the back. A wraparound front porch is a relaxing area for enjoying your morning coffee, curling up with a good book in the afternoon, or winding down in the evening with friends. Reservations: Please call the Willa Cather Foundation at 402-746-2653. Our office hours are Monday through Friday from 9:00 a.m. to 5:00 p.m.
Summer Hours (April 1 to Sept 30): Monday through Friday from 9:00 a.m. to 5:00 p.m., Saturdays from 9:00 a.m. to 5:00 p.m., and Sunday from 1:00 to 5:00 p.m.
Winter Hours (Oct 1 to March 31): Monday through Friday from 9:00 a.m. to 5:00 p.m., Saturdays from 9:00 a.m. to 1:00 p.m.
Willa Cather's parents purchased this home in 1903, leaving behind their little rented home at Third and Cedar Streets where Willa Cather had spent her formative years. Over the next 28 years, Cather often returned to Red Cloud for long visits and was frequently seen reading and writing on the upper front porch. Cather described this house as the Ferguesson family home in her final short story, "The Best Years." Over the years, the home had several private owners and also served as a hospital, nursing facility, and bed and breakfast. It was acquired by the Willa Cather Foundation in 2011 through the generosity of a Cather family descendant. Reservations must be made 24 hours in advance of stay. Check-in time is after 3:00 p.m. and will be arranged with the Willa Cather Foundation. A $10 fee will be charged for early check-ins or late check-outs. We kindly ask that you remove your shoes at the door to help us maintain the beautifully restored wood floors. Soft-soled bedroom slippers are provided for your convenience. The Cather Second Home is a smoke-free and pet-free environment. If you are traveling with pets, we can assist you with arrangements at a kennel in Red Cloud. Cancellations made at least 48 hours in advance of arrival will be charged a $25 handling fee. 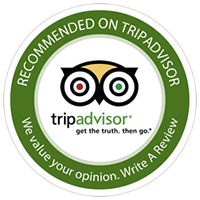 Cancellations made within 48 hours of arrival will be responsible for the balance of their stay. All cancellation notifications must be made by telephone to the Willa Cather Foundation at 402-746-2653. The main floor contains one guest bedroom, called Black Hawk for the town in Cather's novel, My Ántonia. 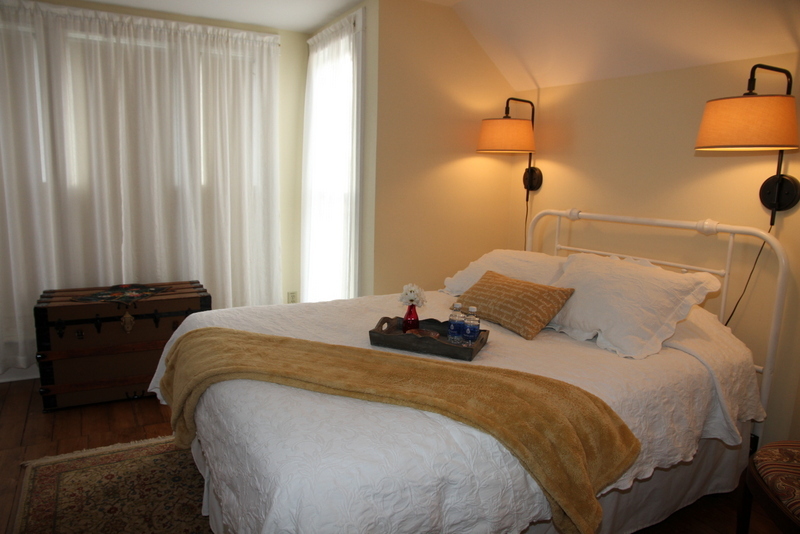 The room has its own ADA- accessible entrance and a cozy queen-sized bed. Historically, this room would have been the Cather family's kitchen. It retains an original white pantry cabinet and a narrow stairway (closed to guests) that once led to the maid's quarters, now known as the Hanover Room.The beautiful hardwood floors and the warm tan color palette create an atmosphere of warm tranquility. It is the perfect retreat for travelers who like to curl up with a good book. The room is located next to the kitchen and is only steps away from the full shared bathroom on the main level. 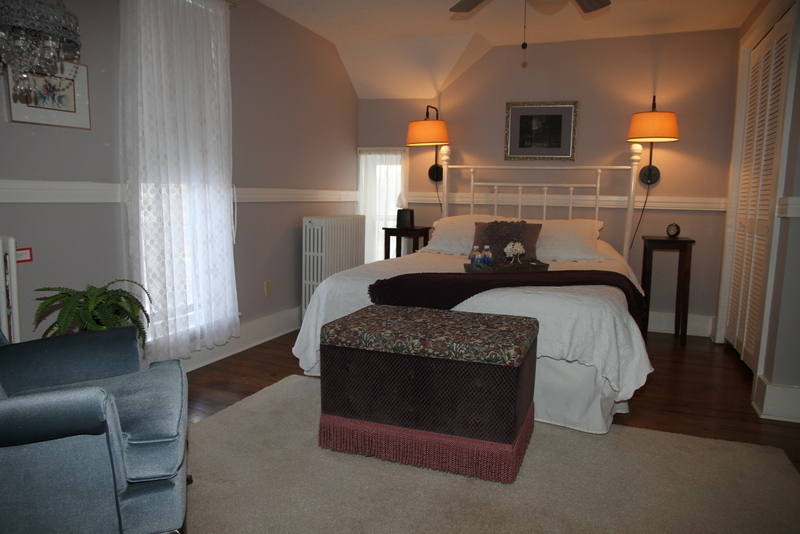 The second floor south bedroom is called Moonstone for the town in Cather's novel The Song of the Lark. During Cather's time, this was the room of Willa's father, Charles Cather. Moonstone is bathed in filtered sunlight during the day and is often moonlit by night. Its muted yellow walls, antique dresser and steamer trunk, and red velvet wingback chair give the room an air of simple comfort. 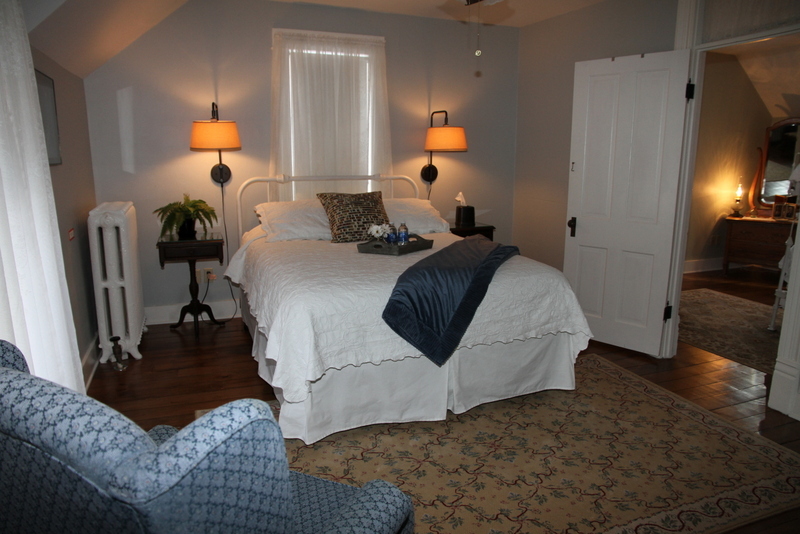 The room features a queen-sized bed and is only nine steps from the nearest shared bathroom. Called Frankfort after the town in Cather's One of Ours, this room was reserved exclusively for Willa's use. The earthy green walls, the fresh white linens of the full-sized bed, and the antique furniture combine to create a tranquil and restful stay. Frankfort adjoins Sweet Water by a door that can be locked from either side. The room is approximately sixteen steps from the nearest shared bathroom. A perfect room to inspire would-be authors! The second floor northeast bedroom is called Sweet Water after the town in A Lost Lady. Adjoining Frankfort by an interior door which may be locked from either side, Sweet Water is calm and cool as its subdued blue walls. Originally, this room belonged to Willa's mother, Virginia Cather. The comfortable queen-sized bed, patterned blue wingback accent chair, and antique dressing table are brightened by the filtered sunlight through the gossamer curtains, creating a peaceful retreat for our guests. 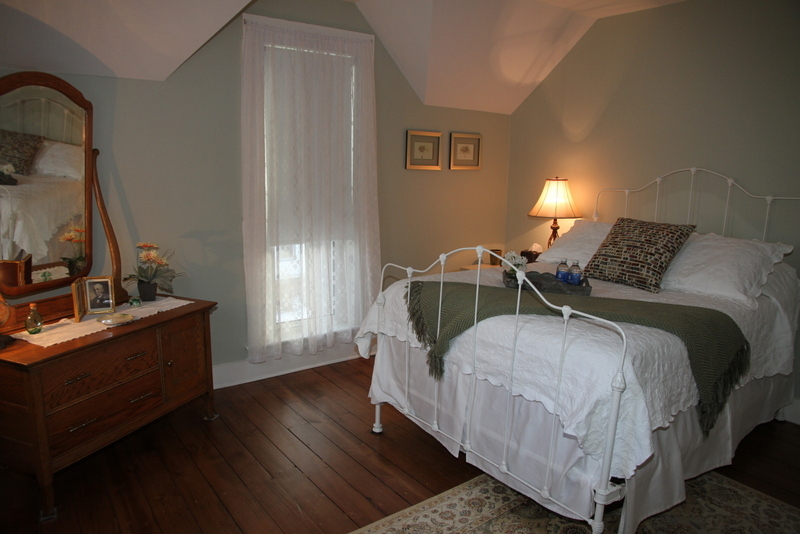 Named after the town in Lucy Gayheart, Haverford was the room of Cather's brother, Douglass. The lilac and cream color palette, the antique mirrored armoire for storage, and the vintage chandelier lend character to the room. Two entrances lead into this room, one at the top of the stairs and one in the central hallway. Located directly across from the shared half bathroom and only nine steps from the full shared bathroom, Haverford is one of our most popular guest rooms, featuring a queen-sized bed and elegant features. The Hanover Room, named after the town in O Pioneers!, is a sunken room—accessed through the half bath on the second floor—and is outfitted with two twin beds. The room contains a narrow set of stairs (emergency use only) that lead down to Black Hawk. Hanover is smaller than other rooms in the home, but features direct access to the shared half bath. The yellow comforters and beautiful patchwork quilts, the gingham curtains, and the intimate space make Hanover a homey, welcoming room. Marjorie Anderson, who spent her life serving the Cathers and moved with them from Virginia, lived in this room.